| NAE Urges Church to Cancel "International Burn a Quran Day"
NAE Urges Church to Cancel "International Burn a Quran Day"
Dove World Outreach Center has been featured on Talk2Action before for their visible anti-Islamic protests. (Photo is Rifqa Bary rally in Ohio, 2009.) In an ironic twist, their pastor, Terry Jones, testified in 1997 U.S. congressional hearings on religious freedom in Europe, where he complained of intolerance and revocation of the tax-free status of his charismatic church in Cologne, Germany. "The NAE calls on its members to cultivate relationships of trust and respect with our neighbors of other faiths. God created human beings in his image, and therefore all should be treated with dignity and respect. The proposed burning of Qu’rans would be profoundly offensive to Muslims worldwide, just as Christians would be insulted by the burning of Bibles. Such an act would escalate tensions between members of the two faiths in the United States and around the world." Terry Jones is an apostle in the "apostolic and prophetic" movement which teaches the "five-fold ministry" preparing the church for the end times. (Note that Jones is not one of C. Peter Wagner's International Coalition of Apostles members.) Jones is also author of the book Islam is of the Devil which can be purchased along with matching coffee mugs. The church provides instructions by Pastor Wayne Sapp on how Christians should go about burning the Quran, complete with a test run. Jones founded and pastored a large independent charismatic church in Cologne, Germany, and was serving there when he testified in U.S. Congressional hearings titled "Religious Intolerance in Europe Today" before the Commission on European Security and Cooperation. The hearings were chaired by Senator Alphonse D'Amato on September 18, 1997, and other witnesses included John Travolta for the Church of Scientology. "We must see the Church again as an army. The Church is in a battle. We see that in the natural and the spiritual realm." The Dove World Outreach Center has also been in the news for their protest against a gay mayoral candidate, and coincidentally, risking their tax exemption status. Student members have drawn attention in the press for wearing their "Islam is of the Devil" t-shirts to local public schools. On August 2, the church will be holding a No Homo Mayor protest in front of the Gainesville City Hall. My previous two-part series of articles (Part One and Part Two) concerned the manipulation of the controversial and tragic situation of a young Muslim girl named Rifqa Bary, by Phyllis Chesler, Pamela Geller, Robert Spencer, and also by New Apostolic leader Lou Engle. 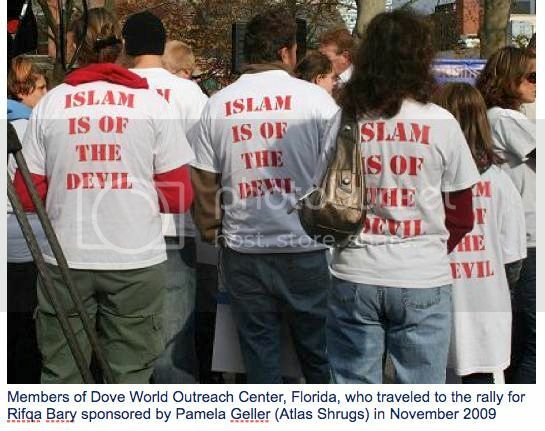 Geller and Spencer led the Rifqa Bary rally in Ohio which at which Dove World Outreach Center attended (pictured above). Geller is executive director of the organization Stop Islamicization of America which has purchased anti-Islamic advertising on public transportation in New York, San Francisco, and Miami. Since I wrote the previous articles, Rifqa Bary's saga took yet another tragic turn when she was diagnosed with an aggressive form of cancer. Also since that posting, and in a related story, Ergun Caner has been demoted at Liberty University. The former dean of the Liberty Baptist Theological Seminary had gained fame in his evangelical career on claims of conversion from radical Islam, but had recently been criticized for lying about his background. One of the supporters who claimed to be able to defend Caner's claims was Jamal Jivanjeee another former Muslim and head of Illuminate Ministries, who was also a primary witness claiming that Bary had been abused by her family. One of Simon & Schuster's imprints will be publishing Pam Geller's screeds in book form in the next few months. In addition, I don't think the idiots who want to burn someone else's holy book realize how much additional harm this could do to American troops overseas in Afghanistan and Iraq. It just gives Al Qaeda one more propaganda weapon, but then that might be just what Dove World Outreach Center wants. in the last couple of days. Pretty interesting, the tangled web of connections. That's the one I had in mind when making this comment. I think all Pam has going for her are her looks, it certainly isn't her mind. wasn't to many years ago, they burned people. He said that where they start burning books, they will end by burning people-which was all too prophetic. I so wish statements like the NAE's would become more prevalent than all the hate. By the way, that was an excellent update on many involved in the tangled web of Rifqa Bary's case. Rifqa also graduated recently with honors. Her 18th birthday is in August, so it will be interesting to see what she herself does with all this then. Hopefully, she'll overcome, not only the influence of the people exploiting her, but the health problems, too. So sad, this case of the exploitation of a zealous young girl. Her parents must be mortified, and probably, very worried about her.